If you’re having your home built, one of the things that you may consider is the type of door locks to use, especially for your front door and back doors. These are the doors that provide access to your house, which is why choosing the right home locks is necessary. You have the option to either have a keyless or keyed door entry. There are different types of locks and they also have their pros and cons. Knowledge about these options would help pick the best choice for your home. These are the traditional locks used in homes. They use keys in order to open the door. The most obvious advantage of using keyless door entry is that they are cost effective and widely available. However, since they use locks, picking and bumping can be done, allowing burglars unauthorized entry. However, there are keyless door entries that provide better security than the others. Here are some of your options. These are the most common types used in households. However, they provide the lowest level of security since they can be easily broken allowing outsiders to gain access to your property. It can be opened by a key from the outside, while a thumbturn can be used to lock and open it from the inside. This is like the knob locks, but instead of the usual door knob, it uses a lever as a handle. This is most common on offices and other commercial settings, but they are also used at homes. 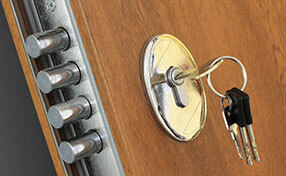 Deadbolt installation is more secured than the other types of keyed entry. This is because only a key can be used to open it from the outside as it does not have a lever or handle. A single deadbolt can be opened from the inside without the use of a key, while a double deadbolt needs a key to open it from the inside. Keyless door entry provides higher security, although they are more expensive. They don’t require keys, so key loss or key replacement wouldn’t be a concern. Here are some of the options for this one. The fingerprints of authorized people will be scanned and saved on the system. Each time that you and other authorized individuals enter the door, you need to have your fingerprint scanned, which is then matched with those that are saved in the system. It provides the highest security, but it’s also the most expensive. Your secret code must be entered to open the door. A battery is needed to use this or it may be wired from an electric source. It works the same way as electric keyless entry as it also requires entering of the secret code. However, it does not use battery or electricity. As the term suggests, it uses a remote or what they call the key fob in opening the door. For more information about these options, don’t hesitate to contact locksmith National City.